We spend a day with Matthew McLendon, curator of modern and contemporary art at The Ringling Museum. Plus, a new produce delivery service and fast-fired pizza. Our panel of judges put their blood sugar to the test to find Sarasota's best cheesecake. The Wench's Willpower combines raspberry syrup, pineapple and grapefruit juices, fresh lime and club soda. Marsha Fottler has a Greek getaway at Blu Kouzina on St. Armands Circle. 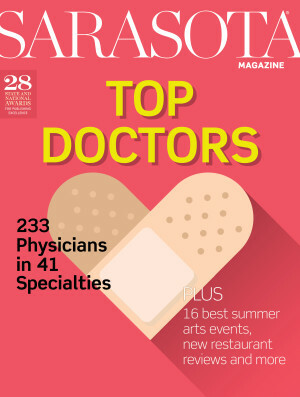 Welcome to our annual listing of the region’s most outstanding physicians, as nominated by their peers and compiled, vetted and verified by Castle Connolly Medical. They're happening in our region every day thanks to trailblazing new procedures and technologies. The latest news in real estate and design. From the Editor: What's Going to Happen to Florida's Land and Water? When it comes to preserving land and protecting water, it's the People of Florida vs. Tallahassee.